When you produce a half-size image from a full-size original, the resulting image occupies only 25 percent of the original area. To look at it another way, three out of every four pixels must be discarded. Without resampling, the tendency is to retain black to avoid loss of content. This is why renderings tend to get very dark when printing half-size drawings from full-size monochrome TIFF images. Dither the scaled grayscale image to monochrome when printing to a monochrome device. 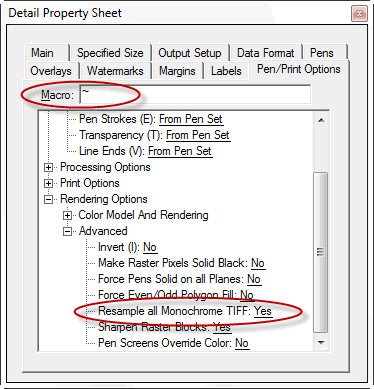 Resampling is invoked during preflight by using the tilde (~) character in the Job Editor's Pen Macro column. 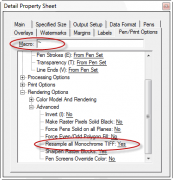 If you can't remember the tilde character, you can always use the Pen/Print Options tab on the Job Editor's Detail Property Sheet. This option is listed under Rendering Options > Advanced > Resample All Monochrome TIFF. It is important to remember that resampling is only applicable to monochrome TIFF images, and only if the scale factor is not 100 percent. When working with vector images PlotWorks always scales prior to rasterization, eliminating the need to resample images. Half-sizes from vector images can still be challenging, but resampling is not required. Save the job as "Template Resample Monochrome TIFF.PLP"
Right-click on the .PLP file that you just saved, choose properties, and set to "Read Only"
More information about resampling, including sample images, is available here.